Ghana became an independent nation on the 6th of March 1957 and a Republic with a Constitution on the 1st of July 1960. The country has gone through a number of political and economic convolutions between 1966 and 1990. Since the beginning of the 4th Republic in 1992, the country has made a steady progress towards economic and political stability. The country is divided into ten administrative regions, which are further divided into 169 districts each with its own district administration. The city of Accra is both the administrative as well as the commercial capital. Ghana is a republic with a constitutional democratic multiparty parliamentary system of government. Governments are elected by a well-developed democratic electoral process based on open and free universal suffrage. According to the constitution, all Ghanaians above the age of 18 years are eligible to elect into office an Executive President for a maximum of two four-year terms and Members of a 230-member legislative parliament for unlimited number of four-year terms. After the last election in December 2008, a new president from the main opposition party took office marking the second time that power was transferred from one legitimately elected government to another. This secured Ghana the status of a stable democracy. Ghana was also ranked 7th out of 48 sub-Saharan African countries in the 2008 Ibrahim Index of African Governance. The main arms of Government are the Executive, Legislature and Judiciary which are independent of each other. The Executive arm of the government is the Cabinet, which comprises the President, the Vice President and members mostly appointed by the President from the Parliament. The constitution also makes a provision for a 25 member Council of State to advise the President, which its membership is both by Presidential appointment and election. The legislature is presided over by a Speaker elected by Parliament. The judiciary or Superior Court of Judicature comprises the Supreme Court, Court of Appeal, High Court, Regional Tribunals and inferior courts which include circuit courts, circuit tribunals, community tribunals and such other courts as may be designated by law. Civil law is based on the English Common Law of equity and general statutes whilst the criminal law is based on the 1960 Criminal Procedure Code derived from amended English Criminal Law. The central government is supported by a local government system which consists of 10 Regional Co-ordinating Councils and 169 District Assemblies. The Regional Co-ordinating Councils are responsible for the co-ordination and direction of the administrative machinery in the 10 regions of the country. Of the 169 District Assemblies, 3 with a population of over 250,000 are designated as Metropolitan Assemblies and 4 with a population of over 95,000 as Municipal Assemblies. The District Assemblies are the pivot of administration and developmental decision-making at the district level and serve as the basic unit of government administration. Ghana is located almost in the middle of the west coast of Africa between longitudes 3o 15’ West and 1o 12’ East and between latitudes 4o 44’ and 11o 11’ North. The Greenwich Meridian passes the eastern part of the country through the port city of Tema. The country has a total land area of about 238,540 km2 and shares 538 km of land boundary with Burkina Faso in the north, 668 km with Cote d’Ivoire in the east, and 887 km, with Togo in the west. The Gulf of Guinea, which is part of the Atlantic Ocean forms the southern border of the country. A large part of the country’s landscape is drained by a number of rivers. The Black Volta flows from Burkina Faso and along the north-western border of the country with Cote d’Ivoire before entering the country at its mid-section. The White Volta also flows from Burkina Faso and enters the country through mid-north and the Oti River flows from Togo and enters the country along the north-east of the country. These rivers, which have a number of potential sites for hydroelectric generation, merge at about the mid-section of the country to form the Volta River. There are two hydroelectric generation stations along the Volta River. A third 400 MWe hydroelectric generation station is under construction on the Black Volta and expected to be commissioned early 2013. Other rivers like the Pra, Ankobra and Tano Rivers with sites for small hydropower potential also drain the west of the country. The climate is warm and humid with annual mean temperatures between 26o and 29oC. Variations in the temperature, rainfall and humidity across the country is governed by the movement and interaction of a hot and dry tropical continental winds (the harmattan), which blows from the northeast across the Sahara desert and a cool and moist tropical maritime winds (the monsoon winds), which blows from the southwest from the Gulf of Guinea. The northern half of the country has one rainy season (from May to October) and one dry season (from November to April). The southern half on the other hand has two rainy and two dry seasons. The major rainy season is May and June, whereas the minor season is from September to November. The minor dry season is in July and August, whilst the major dry season lasts from December to April. The heaviest rainfalls occur in the south-western corner of the country, where the mean annual rainfall reaches about 2230 millimetres. The amount of rainfall generally reduces northwards. The 2000 Population and Housing Census estimated that Ghana's population was about 18.91 million. The annual population growth rate therefore between the last census in 1984 and that of 2000 was estimated to be about 2.67% p.a. The government’s population policy goal is to lower the high annual population growth rate to about 1.50% by 2020. The Ghana Statistical Service medium projection assuming the impact of AIDS indicates that the country’s population will increase from 18.91 million in 2000 to 30.2 million in 2025 and if this trend continues, the population will reach about 32.0 million in 2030, with an average annual growth rate of about 1.88%. In this case, the urbanization rate is expected to increase from 43.75% in 2000 to 62.94% in 2025 and about 63.4% in 2030. According to the UNDP Human Development Report 2007/2008, the average life expectancy at birth is 59.1 years (2005), which ranks 139 and the Human Development Index is 0.553 (2005) which ranks 135 out of 179 countries. In 2000, the average life expectancy at birth and the Human Development Index was estimated to be 57 years and 0.560 respectively. This shows a remarkable improvement in the economy and social welfare. The country’s economy has remained largely agrarian with cocoa as the chief agricultural export commodity since independence in 1957. Gold, manganese, diamonds and bauxite mining are significant industrial activities, which have contributed to a large proportion of the country’s foreign exchange earnings since independence. In the early 1970s, manufacturing played a significant role in the economy and contributed about 14% of the total GDP. Manufacturing’s contribution to total GDP however decreased to about 8% during the economic recession in the early 1980s. Thereafter, the manufacturing sub-sector has been tottering with an average contribution of about 9% of the total GDP. The service sector is the fastest growing sector of the economy with tourism by far the fastest growing sub-sector. The total potential of the tourism has remained largely unexploited. The government’s main economic priority is creating an enabling atmosphere for the economy to grow and achieve a GDP per capita of US$ 1000 at constant 2000 dollars by 2020. The government’s strategy to achieve its target hinges on the promotion of private investments in manufacturing and agriculture sectors to diversify its export basket and avoid the adverse impacts on the economy of fluctuating world market prices of cocoa and other primary export commodities. The commencement of crude oil and natural gas production in the last quarter of 2010 from the Jubilee Field, which was discovered in 2007, is expected to bolster economic growth, to sustain the long-term projected average annual growth rate of 6 - 8%. This future economic growth is expected to be accompanied with a structural change in the economy. The country is not very much endowed with commercial energy resources. There are neither known reserves of coal nor uranium deposits. In 2007, the country announced the discovery of about 800 million barrels (or 112 million tonnes) of crude oil and 880 billion scf (or 30.88 billion m3) of associated natural gas in-place off-shore in the Cape Three Points sedimentary basin. This discovery although commercially attractive, is meagre compared to the giant fields in Nigeria, a country in the same sub-region. There has been marginal production of about 550 barrels per day of crude oil from off-shore Saltpond fields in 2008. The hydropower potential available in the country has been estimated to be about 1864 MW of which about 85% would have been exploited by the end of 2012. There has sometimes been low capacity utilization of the hydropower systems due to perennial droughts especially in 1983/84, 1997/98 and 2006/07 when the droughts were very severe. In order to address this situation of shortfalls in generation from the country’s hydropower systems due to perennial droughts, the hydropower systems in 1998 were complemented with thermal power electricity generation based on light crude oil. However, high international crude oil prices since 2005 has made thermal power electricity generation cost very expensive. The government has therefore made efforts to import about 474 mscft/day or (13.41 million standard cubic meters/day) of natural gas from Nigeria for electricity generation and some industrial use. The delivery of gas imports from Nigeria has been delayed due to instability in Nigeria’s Delta Region. Estimates have also indicated that the gas import from Nigeria cannot suffice the country’s gas demand beyond 2020. Wind potential in the country is also low estimated at about 300 – 500 MW. The average annual solar irradiation in different parts of the country ranges from 4.4 kWh/m2/day to 5.6 kWh/m2/day. This large solar potential can be effectively harnessed for electricity and process heating purposes but the current cost of the technology is excessive and cannot be easily affordable. Consequently, the future primary energy supply situation is precarious. Nuclear energy which is less susceptible to future supply disruption and impact of price hikes posses as a strong viable option to address future primary energy supply security for the country. There was a change in the country’s energy policy direction in 1994 when the government took the decision to restructure the whole energy sector. This decision was prompted by the need to create the appropriate environment which could attract private investments and relieve the government from investing public fund in the energy sector. The strategy was expected to improve the general operational efficiency of the sector to ensure the delivery of adequate and sustainable energy supply. The government’s role in the energy sector is now limited to indicative energy planning, policy formulation and market regulation. To fulfill these roles, the government in 1997 by the Public Utilities Regulatory Commission (PURC) Act of Parliamentary Act 538 established the Public Utilities Regulatory Commission to regulate tariffs and ensure the provision of quality services (electricity, natural gas and water) by public utilities. The Energy Commission was also established in 1997 by Energy Commission Act of Parliament Act 541 to among other functions advice the Minister of Energy on national policies for the efficient, economical and safe supply of electricity and natural gas; to prepare, review and update periodically indicative national energy plans to ensure that all reasonable demands for energy are met; to receive and assess applications and grant licenses under the Act to energy service providers for the transmission, wholesale supply, distribution and sale of natural gas and electricity. To complete the reform process of the electricity sub-sector, the Volta River Development Act 61 was amended in 2005 by Volta River Development Amendment Act of Parliament, Act 692 to cede away the transmission function from the Volta River Authority to a new public transmission utility – the Grid Company of Ghana (i.e. GRIDCO). The Parliament in 2008 enacted the Wholesale Electricity Market – Technical Rules (i.e. Legislative Instrument No.1934) and Wholesale Electricity Market – Operational Regulations (i.e. Legislative Instrument No. 1937) to consolidate the electricity sector restructuring. These legislations effectively established the Wholesale Electricity Supply Market for electricity trade. The Wholesale Electricity Supply Market will be operated by an Independent System Operator (ISO), which is the GRIDCO to ensure effective electricity trade. The restructuring of the petroleum downstream sector, was accomplished when the Energy Commission Act 541 was amended in 2005 by National Petroleum Authority Act of Parliament Act 681 to cede away the monitoring of the downstream petroleum sector to a newly established National Petroleum Authority.The main target areas of the government’s current energy policy are (i) expansion of electricity generation and oil refinery capacity through private participation; (ii) expansion of strategic reserves of petroleum products; (iii) efficient market operation and realistic energy pricing policy; (iv) conservation and efficient use of energy; (v) development of domestic energy resources and increased use of renewable energy sources, (vii) increasing access to electricity and petroleum products and (viii) the consideration of nuclear energy for electricity generation in the long-term and (ix) the promotion of inter-regional energy trade in natural gas (e.g. West African Gas Pipeline) and electricity (e.g. West African Power Pool) due to limited domestic commercial energy resources. The main policies that govern plans, programmes and projects in the electricity sector are formulated by the Ministry of Energy. The Energy Commission also submits policy proposals for the efficient, economical and safe supply and use of electricity, natural gas and petroleum products to the Minister of Energy for consideration. Aside the policy to restructure the electricity sector, other sector policies seek to diversify the generation mix; attract private sector investment in the expansion of electricity generation capacity; ensure universal electricity coverage by 2020; conservation and efficient use of electricity and the promotion of regional trade in electricity. The planning of the electricity system is the responsibility of the Energy Commission. The Commission has undertaken the development of Strategic National Energy Plan (2006 – 2020) and Planning for Sustainable Energy Development – Ghana Country Study (2004 – 2030) studies. The Volta River Authority, the public utility responsible for electricity generation from hydropower systems in the country has also undertaken a study on Electricity Generation and Transmission Master-plan (2000 – 2020). These planning studies and the Bui Hydropower Feasibility Study Update have proposed the construction of the 400 MWe Bui Hydropower plant on the Black Volta. This plant is currently under construction and is expected to be commissioned early 2013. According to the Planning for Sustainable Energy Development – Ghana Country Study, the total electricity generation capacity is expected to increase from 1730 MWe in 2005 to about 8200 MWe in 2030 if we assume Reference Scenario electricity demand projections. It has been projected that over 65% of the capacity in 2030 will depend on combined cycle gas turbine using imported natural gas from Nigeria. There has been a long delay in the delivery of compressed natural gas from Nigeria for electricity generation. Consequently, there is currently no reserve capacity in the country’s generation system, but rather the reliance on electricity imports from Cote d’Ivoire and the use of expensive light crude oil and diesel for electricity generation. It obvious that further delays in the delivery of natural gas from Nigeria in the face of poor hydrology of the country’s hydropower systems, high international prices of crude oil and diesel will jeopardise the delivery of electricity in the country. The Ministry of Energy is at the apex of the electricity system. This is followed by two regulatory institutions; the Public Utilities Regulatory Commission and the Energy Commission. The Volta River Authority (VRA), a public utility established in 1961 by the Volta River Development Act (Act 61) is responsible for the development of hydropower resources in the Volta Basin for electricity generation. The VRA has 1180 MWe of hydropower capacity and, 440 MWeThermal Power Plant which uses light crude oil. The VRA also has 10% interest in a joint venture with an IPP for the ownership of a 220 MWe Thermal Power Plant, which also uses light crude oil. As at the beginning of 2009, there was about 280 MW total capacity of diesel power plants owned by some Independent Power Producers (IPPs). Until 2005, VRA was responsible for the construction and operation of the transmission network, which is made up of 36 substations and approximately 4,000 km kilometers of transmission lines. 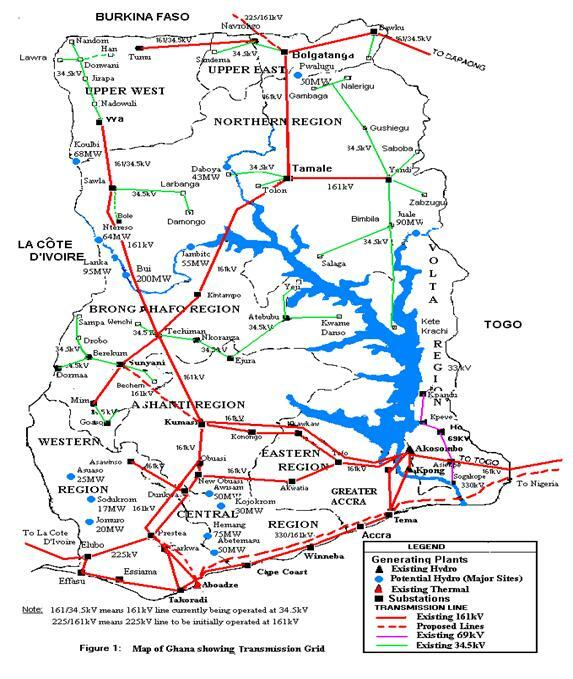 As part of the restructuring of the electricity sector, the Parliament enacted in 2005 the Volta River Development Amendment Act, Act 692 to cede the transmission functions of the VRA to a new public utility Grid Company of Ghana Ltd to construct and manage the transmission network. In order to promote competition among electricity generators, the the transmission network has been made an open access and non-discriminatory public facility. The transmission network is inter-connected with the network of CIE of La Cote d’Ivoire and that of CEB of Togo/Benin. A 33 kV line also connects to the network of SONABEL of Burkina Faso. The diagram of the transmission network is shown below. In order to effectively complement the initial transmission functions of the Volta River Authority, the Electricity Corporation of Ghana (ECG) a public utility was set up in1967 by National Liberation Council Decree 125 to purchase bulk electricity from the Volta River Authority for distribution to household, commercial and industrial customers throughout the country. In parts of the country where there is no grid, the ECG was given the mandate to establish diesel generation plants for the supply of electricity. For effective management of the electricity distribution system, the government in 1987 established the Northern Electricity Department as a subsidiary of Volta River Authority to take over electricity distribution in the northern segment of the country so that the Electricity Corporation of Ghana could focus their operation on the southern segment only. In 1998, the Electricity Corporation of Ghana was converted to Electricity Company of Ghana as part of the restructuring of the electricity sector. The electricity distribution network is made up of about 14,139 km of sub-transmission lines, about 77,000 km of distribution lines and supplies electricity from 27 bulk supply points. Note 2: In 1998 and 2000, 330 MW and 220 Thermal Power Plants came online. Note: Energy production and consumption excludes biomass. The country’s effort to acquire nuclear energy technology in its peaceful applications for national development dates back to 1961 when the government of the first republic took the decision and initiated the Kwabenya Nuclear Reactor Project. The Ghana Atomic Energy Committee was established to implement this project. This committee was replaced by the Ghana Atomic Energy Commission in 1963by an Act of Parliament (Act 204, 1963) and was given the mandate to build a nuclear research reactor for nuclear science and technology education in the country. A National Nuclear Research Institute (NNRI) was also established in 1963 to operate all high-level government owned nuclear facilities in the country. The Kwabenya Nuclear Reactor Project was cancelled in 1966 when the government of the first republic was overthrown by a military coup d’état. In 1973, new management and Reactor Technical committees were established to reactivate the reactor project. Efforts were then made to acquire a one megawatt research reactor from Germany as part of reactivating the project. These efforts however became futile when all arrangements were cancelled due to an unconstitutional change of government in 1981. Hence, the National Nuclear Research Institute (NNRI) had to carry out its activities without a reactor. Therefore, in December 1994, a 30 kW miniature neutron source Chinese research reactor was acquired by the Ghana Atomic Energy Commission with support from the IAEA. The decision to consider nuclear energy for electricity generation was prompted by a protracted drought in the sub-region between 2003 and 2006, coupled by low electricity imports in 2007 and the high crude oil prices in 2006/07.As a result of the drought, the country’s hydropower systems suffered a drastic decrease of about 33% in generation in 2007 compared to the generation in 2006. Electricity imports from Cote d’Ivoire in 2007, which was expected to increase to compensate for the shortfall rather decreased by 30% compared to the imports in 2006. Consequently, to cope with the shortfall in electricity supply in 2007, the country embarked on a nationwide load shedding exercise and increased generation from thermal power plants using light crude oil and diesel. However, the very high crude oil and diesel prices in 2007 increased the average cost of electricity generation and the end-user tariff by 30% compared to 2006. In order to address the vulnerability of the country’s hydropower system and ensure the security of electricity supply, the government in April 2007 announced its intention to deploy nuclear power for electricity generation. The government in May 2007 inaugurated a 7-member Committee to explore the possibility of expanding the country’s electricity options to include nuclear power and develop a Roadmap for a Nuclear Power Programme. The Committee after its assessment recommended that the government sets up a Presidential Commission on Nuclear Power Development (PCNPD) to develop a draft Nuclear Power Policy and undertake the technical and financial feasibility study for the implementation of a Nuclear Power Programme. The Committee further recommended that the government develops a legal framework for the operation of nuclear power facilities in the country and a regulatory body for the regulation and enforcement of technical standards for nuclear safety and radiological protection. Finally the Committee recommended that the government accedes to all international agreements and protocols related to non-proliferation, physical protection, nuclear safety and security as well as civil liability. These recommendations have not implemented due to a change in government in December 2008. The new government is reviewing the recommendations of the Committee and is expected to take a major decision to launch the country’s nuclear power programme before the end of 2009. Currently, there is no organizational system in-place for the implementation of nuclear power programme in the country. However, the Committee recommended the structure below and the stakeholders or the organizations that might be involved in the various tasks to be undertaken by the Presidential Commission on Nuclear Power Development (i.e. equivalent of NEPIO) are listed below. The Energy Commission and the Ghana Atomic Energy Commission are currently involved in the preparatory work for the implementation of a nuclear power programme. The Energy Commission is coordinating a national TC project GHA/0/011 – “Evaluating the role of Nuclear Power in Future Options for Electricity Generation” and regional TC project RAF/0/033 – “Increasing Awareness at Decision Making Level about the Requirements and Challenges Related to the Feasibility of a Nuclear Power Programme”. The Ghana Atomic Energy Commission is also coordinating the regional TC project RAF/0/034 – “Establishing a Legal Framework for the Safe and Peaceful Uses of Nuclear Energy” The outcomes of these projects are expected to outline the framework for the development of a Strategic Plan for the Implementation of a Nuclear Power Programme. No nuclear power plant is currently operating in the country. ** Latest available data + Date, when first major placing of concrete, usually for the base mat of the reactor building is done. 2.3. Future development of Nuclear Power. The government in April 2007 announced its intention to deploy nuclear power for electricity generation and inaugurated a Nuclear Power Committee in May 2007 tasked with the responsibility to develop a Roadmap for deployment of Nuclear Power for electricity generation in the country. After its assessment, the Nuclear Power Committee of 2007 recommended the deployment of nuclear power for electricity generation and proposed the formation of a permanent Presidential Commission on Nuclear Power Development (equivalent of NEPIO) as a first step. The new government elected in December 2008 is reviewing the recommendations of the Nuclear Power Committee and is expected to take a major decision to launch the country’s nuclear power programme. The Energy Commission is facilitating the establishment of a NEPIO. Ghana Atomic Energy Commission is exclusively in charge of nuclear research and application. It undertakes research with a 30 kW miniature neutron source Chinese made research reactor.The reactor was acquired in December 1994, with support from the International Atomic Energy Agency. In 1963, the National Nuclear Research Institute (NNRI) was established to promote and strengthen nuclear science and technology research, training and development for development for socio-economic development of Ghana. The Ghana Atomic Energy Commission also has research centres for mathematical sciences, radiation technology, radioactive waste management and reactor research. In an effort to develop the capabilities for the deployment of nuclear energy for peaceful applications the country has been collaborating with the IAEA in various fields. The country has benefited from a number of IAEA Technical Cooperation projects. In 2004 the IAEA approved a TC National Project GHA/0/008: Planning for Sustainable Energy Development – Ghana Country Study with the objective to train Ghanaians in the use of IAEA energy planning tools. The IAEA has again approved a TC National Project GHA/0/011: Evaluating the role of Nuclear Power in Ghana’s future electricity generation mix, which is expected to be a techno-economic feasibility study of the role of nuclear power. The project comprises site survey and selection, electricity grid assessment, developing legal and regulatory framework for the deployment of NPP and public education. The project is expected to serve as an input for the development of a strategic plan for the implementation of a nuclear power programme and the country’s first nuclear power plant. In September 2007, Ghana signed and joined the Global Nuclear Energy Partnership (GNEP). In line with the provisions of the Ghana Atomic Energy Commission Act 588, the Commission acquired a 30 kW research reactor for the training of scientists and engineers in the country. The IAEA under the TC National Project GHA/0/010 supported the Ghana Atomic Energy Commission in collaboration with the University of Ghana, to establish the School of Nuclear and Allied Science to develop human resource in the field of nuclear and allied science in accordance with the provisions of Article 3 of the Ghana Atomic Commission Act 588 of 2000. This institution is expected to provide some level of human resource to support the country’s nuclear power programme. In 1993, the government enacted PNDC Law 308 to establish the Radiation Protection Board as the sole National Competent Authority for the control and use of radiation sources, licensing and inspection of radiation applications in the country for the sole purpose of protection and safety. Alongside, the Radiation Protection Institute was established under Ghana Atomic Energy Commission to provide scientific and technical support to the Radiation Protection Board and the regulatory framework for radiation protection, the disposal of radioactive waste and the safety and security of radioactive materials and nuclear installations. According to the proposed Ghana Nuclear Energy Bill 2009, the Radiation Protection Board is expected to be upgraded into an independent and competent regulatory body to be referred to Ghana Nuclear Regulatory Authority (GNRA). According to the nuclear bill the GNRA is expected to adjudicate in all matters relating to nuclear safety, security and safeguards of nuclear materials, licensing, and monitoring, and radiation protection.